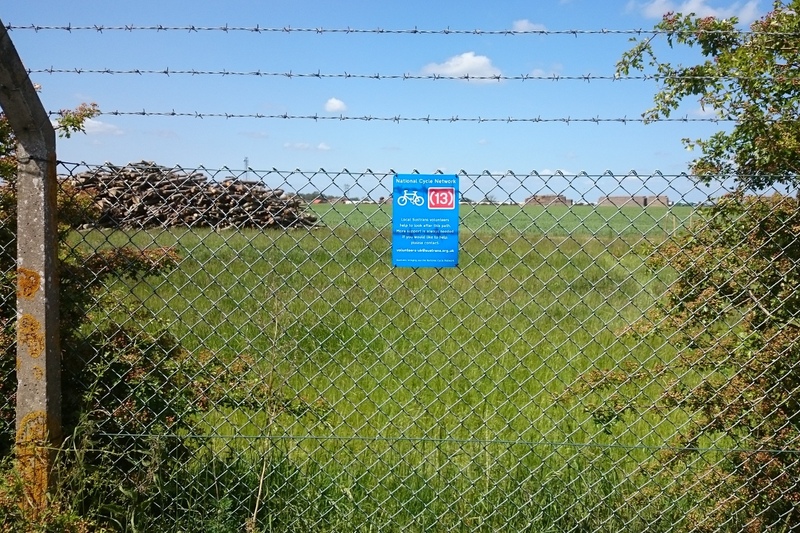 Today I went out to check on a section of route I hadn’t visited for a while: Regional Route 30 between Thetford and Weeting. The route itself was fine, though I needed to do a few sign repairs in Brandon. 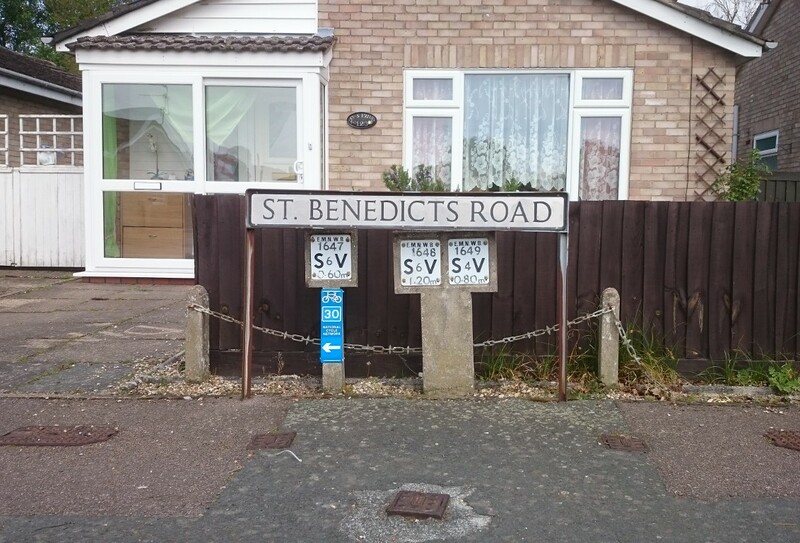 One sign on Woodcock Rise needed a clean, three signs were missing on DOwnham Way and St Benedict’s Road where the lamp-posts they had been attached to had been replaced by the Council, and there was one sign on a pipeline marker post on St Benedict’s Road that needed re-attaching. I went out to check this section of National Route 13 and Regional Route 30 today. All the signage was fine. 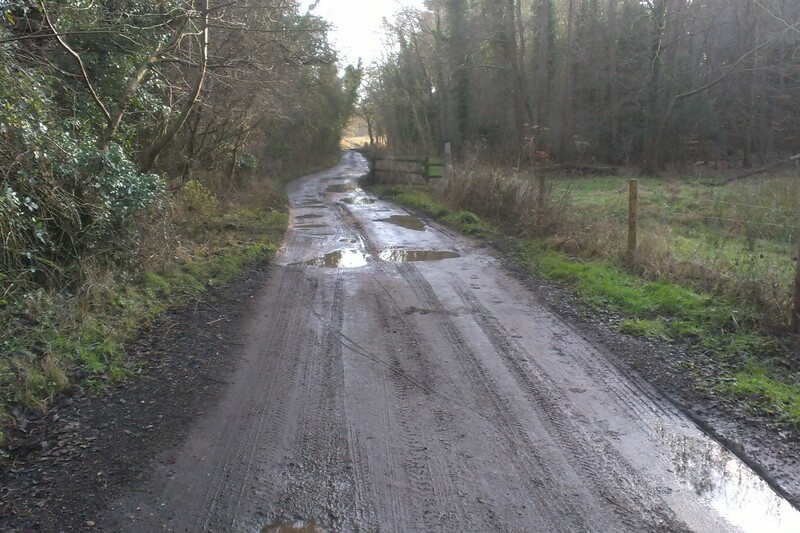 Green Lane in Thetford was a little muddy / puddly in places but was ok. The worst part was the Restricted Byway of Bridgham Lane. There were several flooded potholes, some covering the whole width of the track. Nearer the southern end, the sandy nature of the track meant the surface was not very firm, and could be slippy in places. I shall report this to Norfolk County Council to see if there is anything that can be done. I went out on a regular route inspection this afternoon, to check on Regional Route 30 between Thetford and Harling woods. 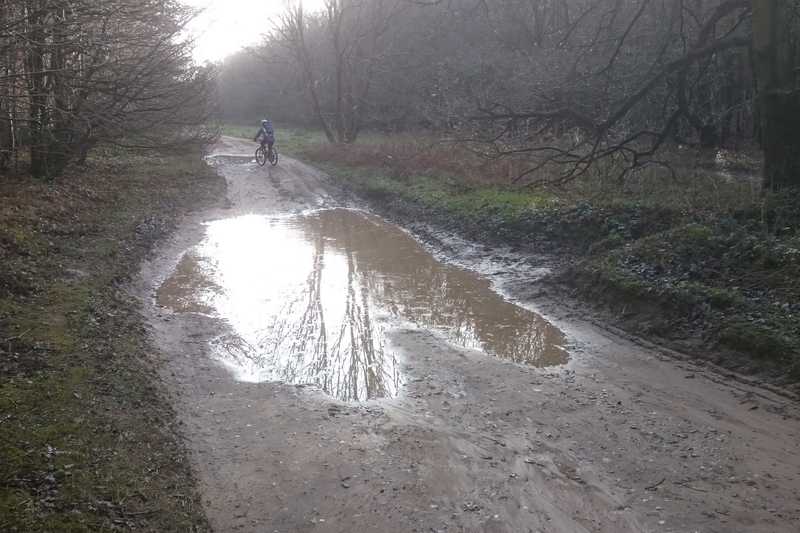 Everything was ok, though the surface of Bridgham Lane was very sandy and hard to cycle on. It will need watching in the future. 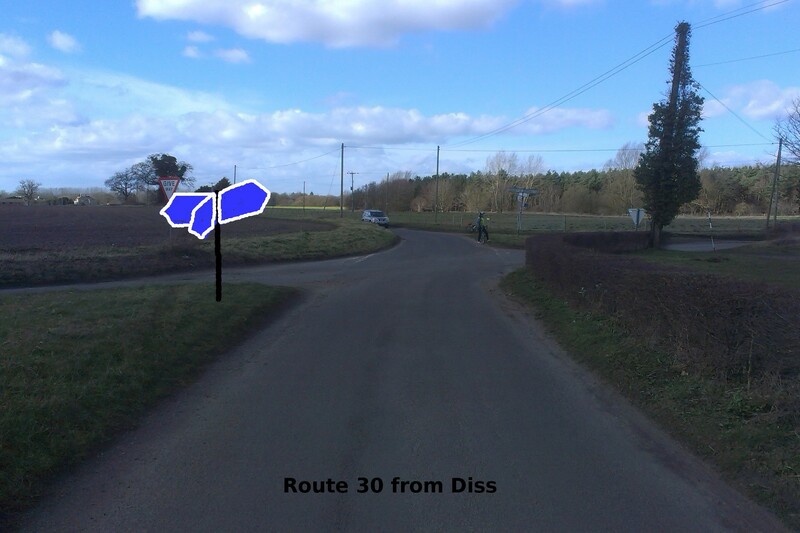 I went out to check my section of Regional Route 30 between Thetford and Harling Woods this evening. 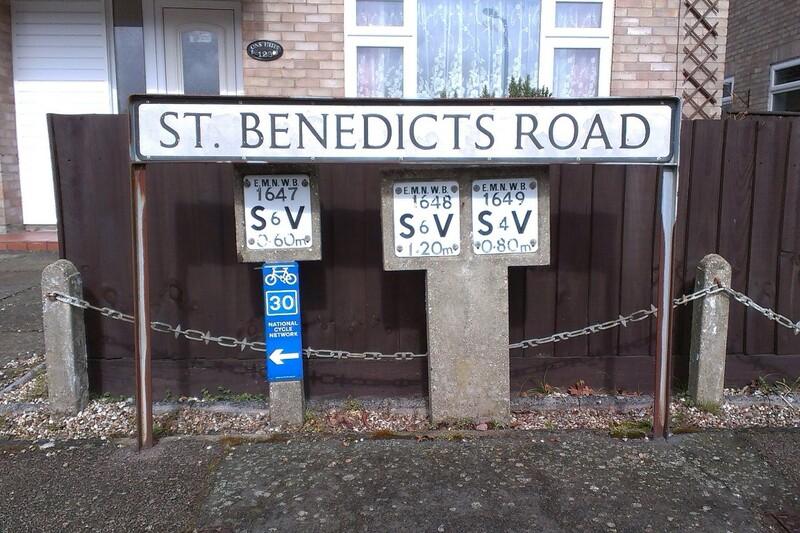 One sign needed a bit of re-attachement to a telegraph pole, which I did. 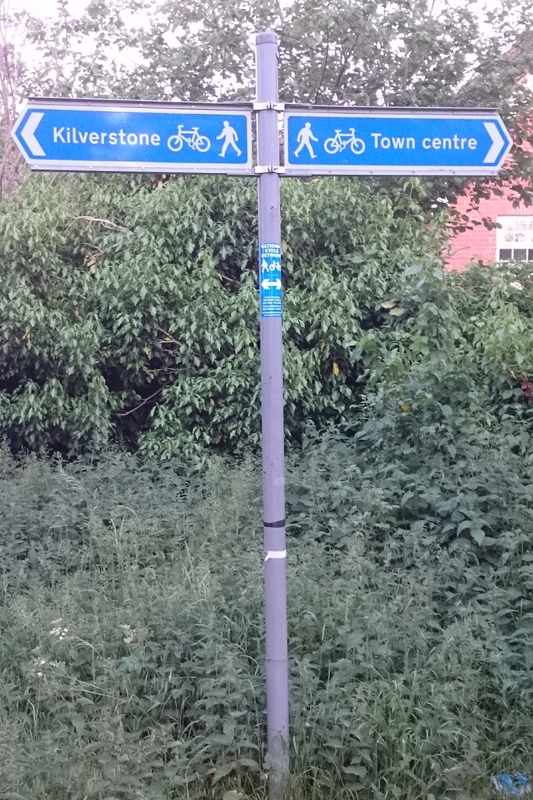 Another sign just before the left turn off Kilverstone road onto Green Lane in Thetford was obscured by undergrowth, which could do with cutting back at some point. 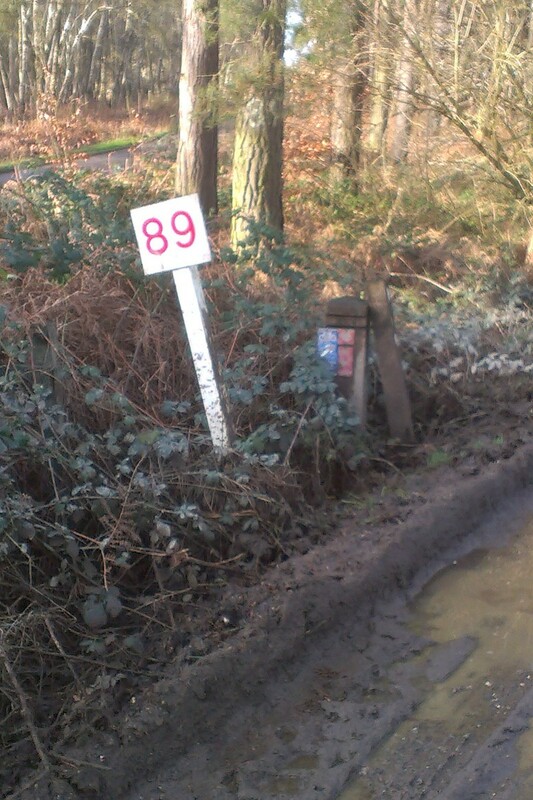 The only other issue I found was that Bridgham Lane was again rather sandy. We may have to look to divert the route is the surface can’t be improved. 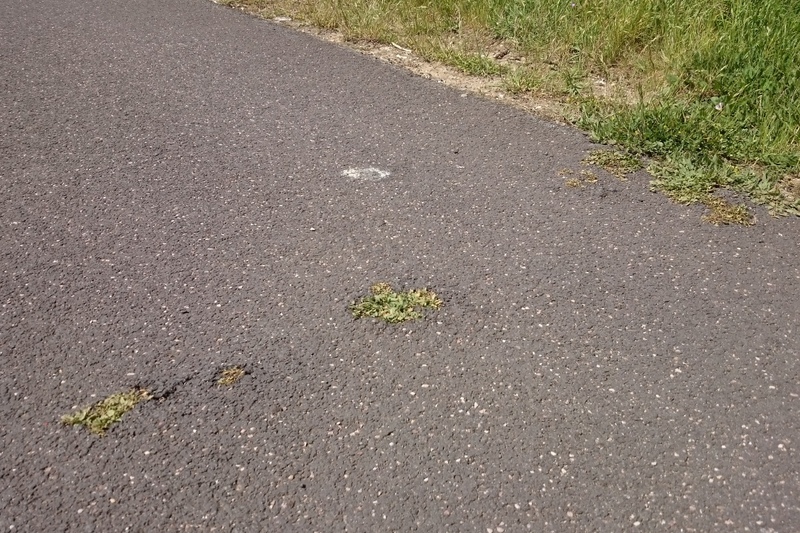 While out putting up volunteer recruitment signs, I also noticed a few places on Stan’s Walk (the Watton–Griston cycle path) where weeds have been pushing up the surface and in some cases breaking through. Things aren’t too bad at the moment, but they’ll only get worse if left untreated. 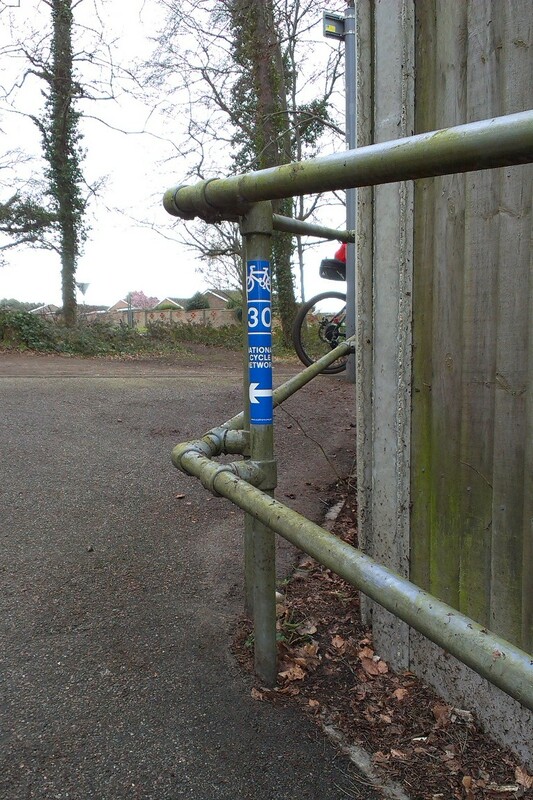 Update (2015-06-12): I’ve now reported these to Sustrans and Norfolk County Council to see what can be done. The Council reference number is 514511. 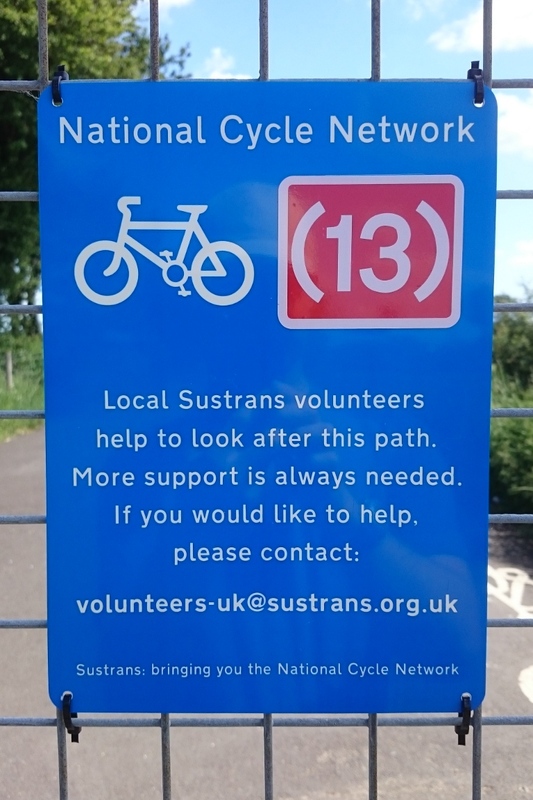 The Breckland and Waveney Valley Sustrans Ranger Group is in need of some more volunteers, to help look after various parts of the National Cycle Network, around Thetford, Brandon, Watton and Dereham. For an up-to-date list of areas in need, and details of what help is needed, see the Volunteer Page. 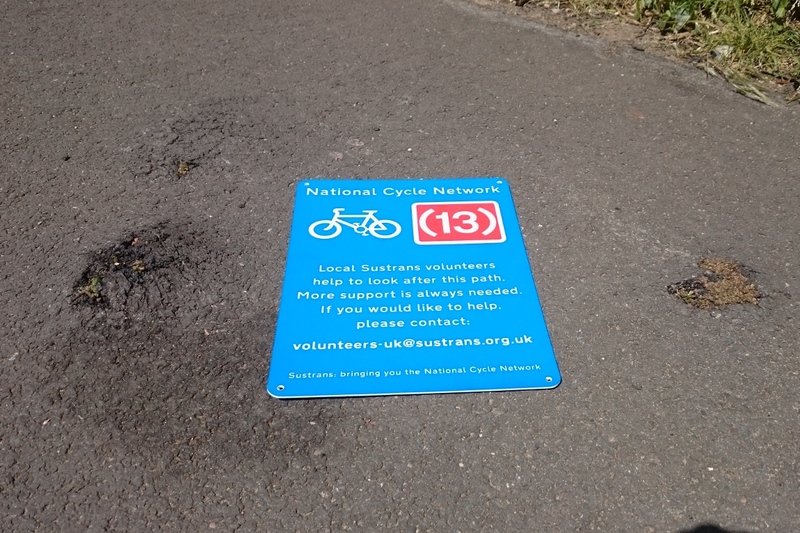 To help attract new volunteers, Sustrans has some special signs available to put up on NCN routes. 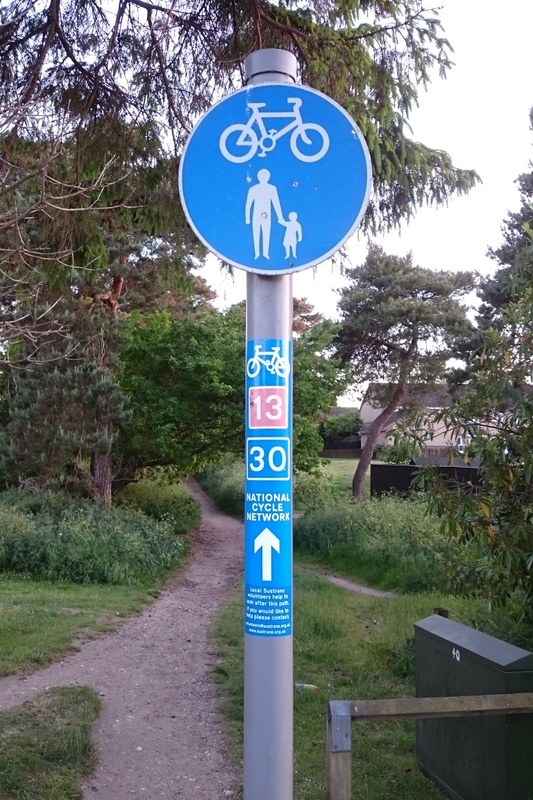 I’ve acquired a few of these, and have just put some up along Green lane in Thetford, and the Watton–Griston cycle path. 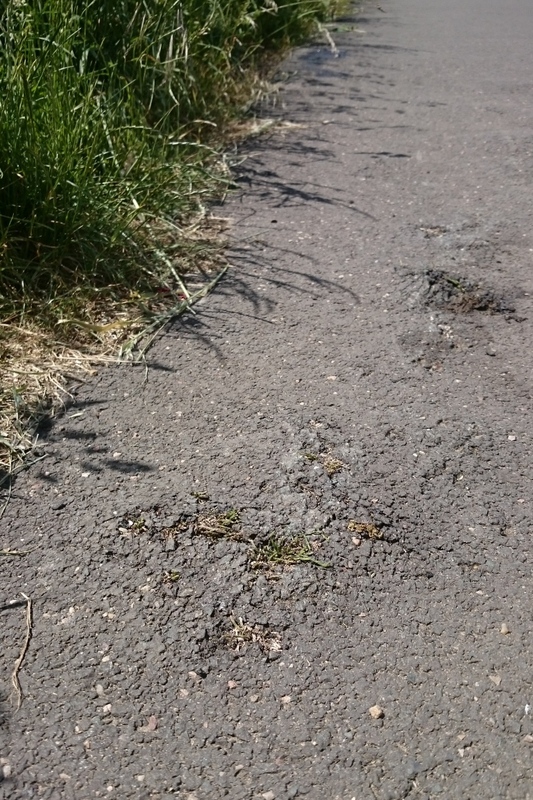 While out putting up the signs, I also noticed a few problems with the surface of the Watton–Griston cycle path. 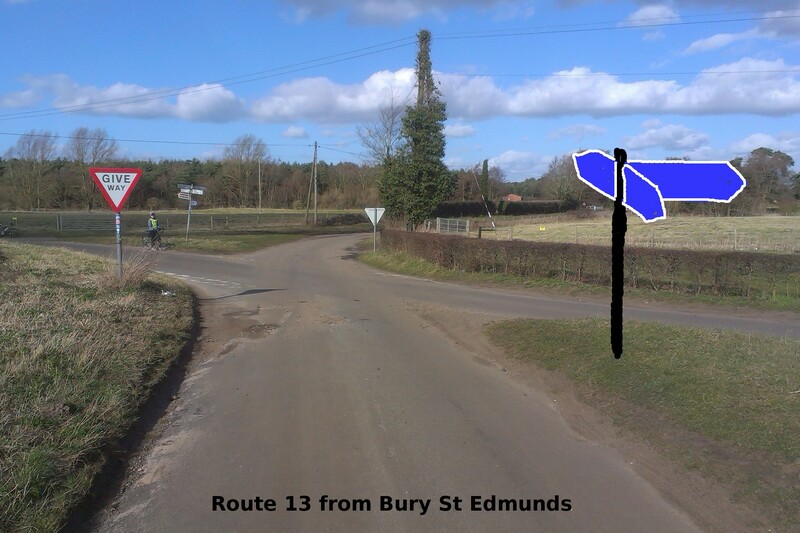 I went out for a circular ride today, taking in the section of National Route 13 between Dereham and its junction with Route 1 just north of Gateley. We then followed Route 1 to Reepham (with lunch at the Kerris Farmhouse Pine Tearooms), before returning to Dereham. 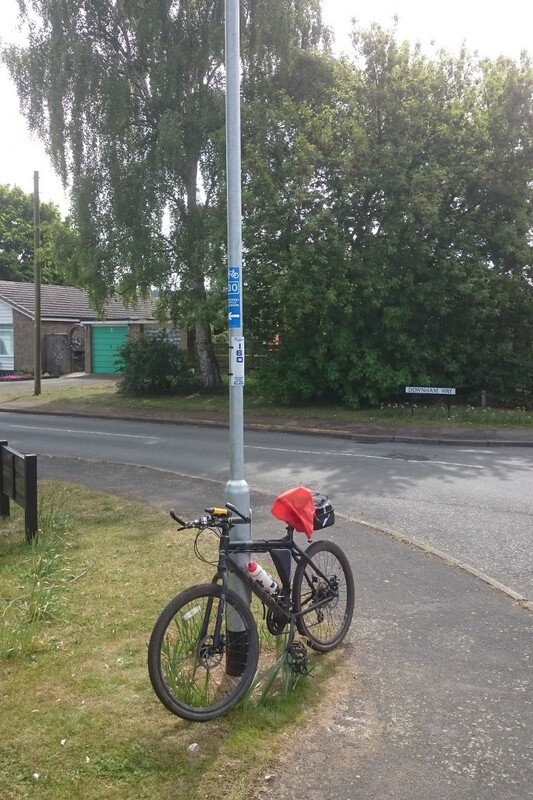 This was the first time I’d cycled most of this part of Route 13, and it hasn’t had a volunteer ranger for some time (anyone interested in volunteering?). Nevertheless, the signage was mostly fine, largely because a lot of it was done with permanent metal signs erected by the local council. There were a few places where an additional confirmation sign might be useful, and several instances of the hard-to-spot tiny square “13” plates in use. I didn’t stop to address these, as they weren’t that urgent. There was one permanent sign on the B1146 that needed a little rotation to get it back pointing the right way, which I was able to do. 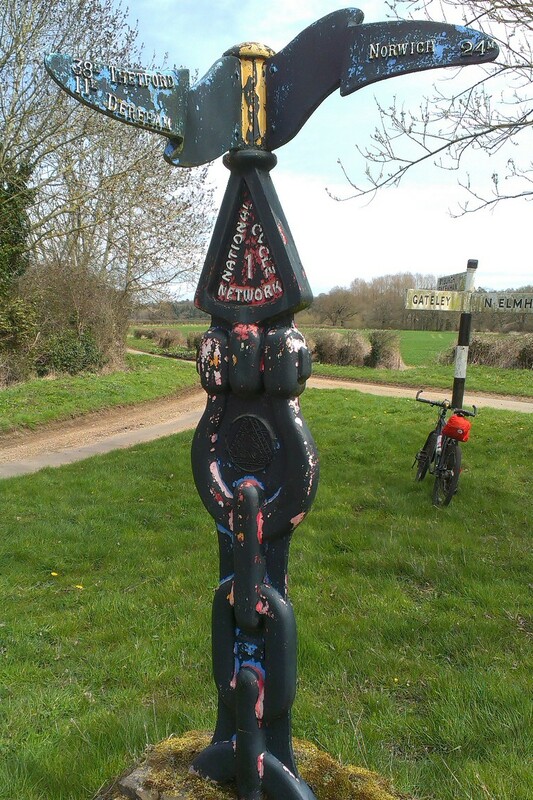 I also checked the two Millennium Mileposts on this section of the route. 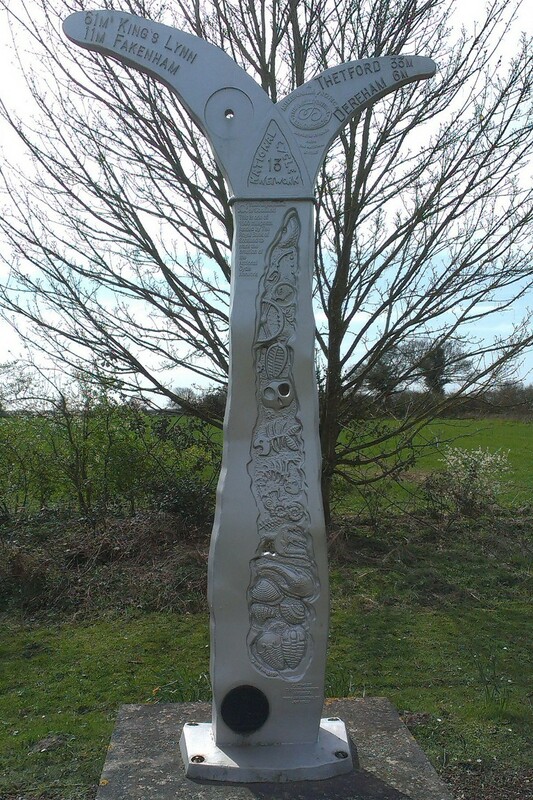 There’s a Mills Post at the junction with the B1146 between Beetley and East Bilney, and a Rowe Post at the junction with Route 1, just north of Gateley. Both had firm bases, and the arms and posts were all securely attached to each other. 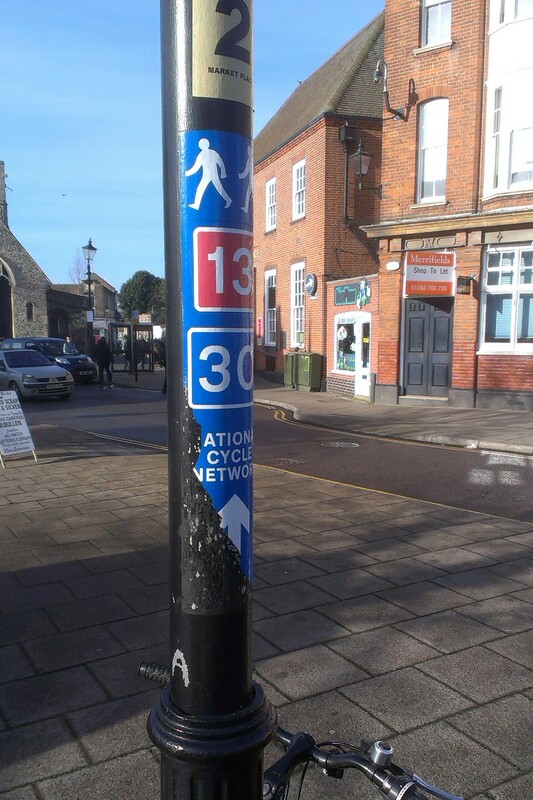 However, the Post at the junction with Route 1 looks like it could do with a new coat of paint. This is something I’ll look into in conjunction with the East Norfolk Ranger Group who look after that stretch of Route 1. 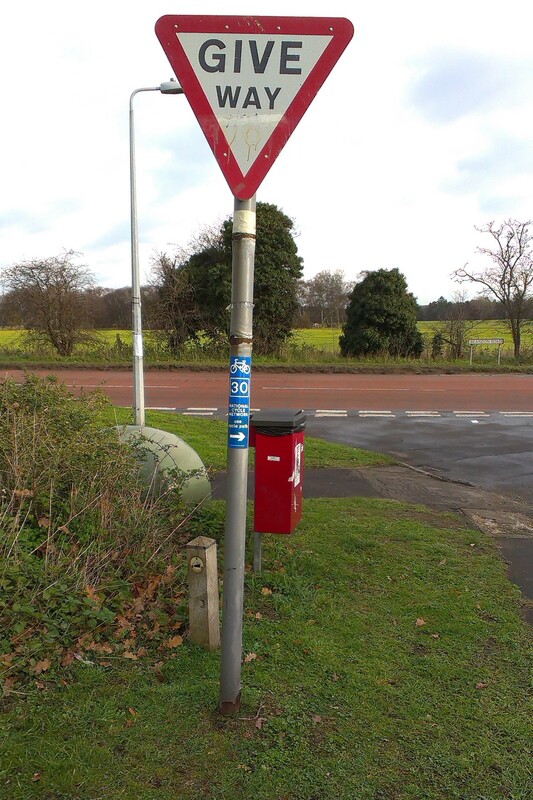 Finally, while I was following Route 1 jest west of Broom Green, there was a missing sign at a left turn. I didn’t have any “1” patches with me, nor my staple gun, and the only available place to put a sign was a telegraph pole. So I did my best with a self-adhesive sign. Hopefully it will last long enough until a local ranger can do something better. 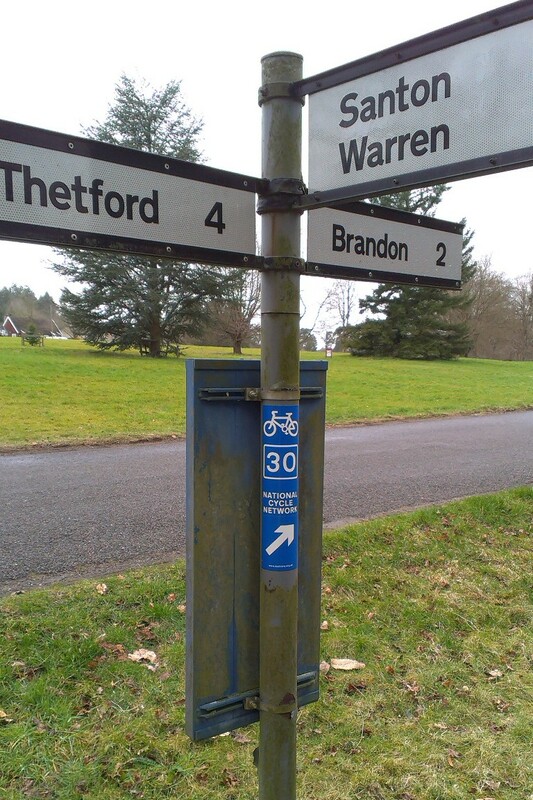 I went on an inspection ride along Route 30 this morning, on the way back to Thetford from Brandon Parkrun. Mostly everything was ok, but a few minor issues required attention. 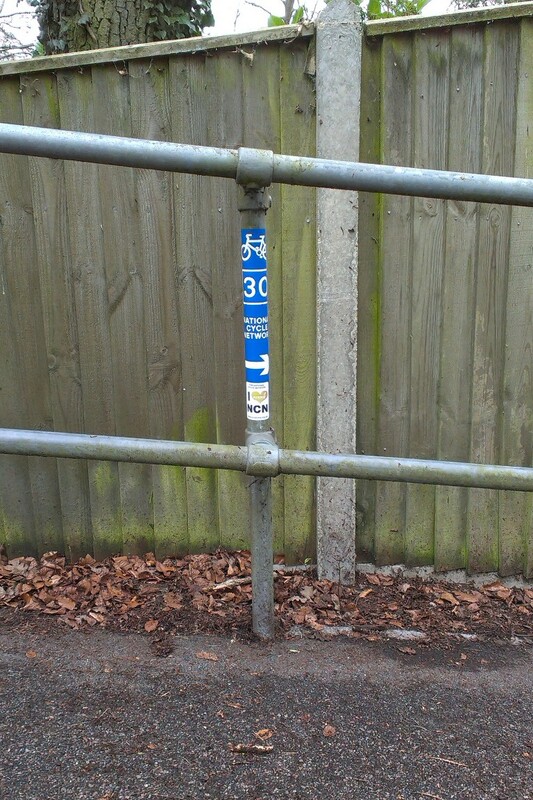 A rigid sign attached to a marker post with cable ties on St Benedict’s Road had been cut off. The sign and the cut ties were lying on the ground nearby. I didn’t have any more ties with me, but was able to use the existing ones to secure the top of the sign. I returned the next day to finish the job. Two signs at the top of the cut-through from the C622 to Woodcock Rise needed a clean, as did the signs at the junction outside St Mary’s Church in Santon Downham. 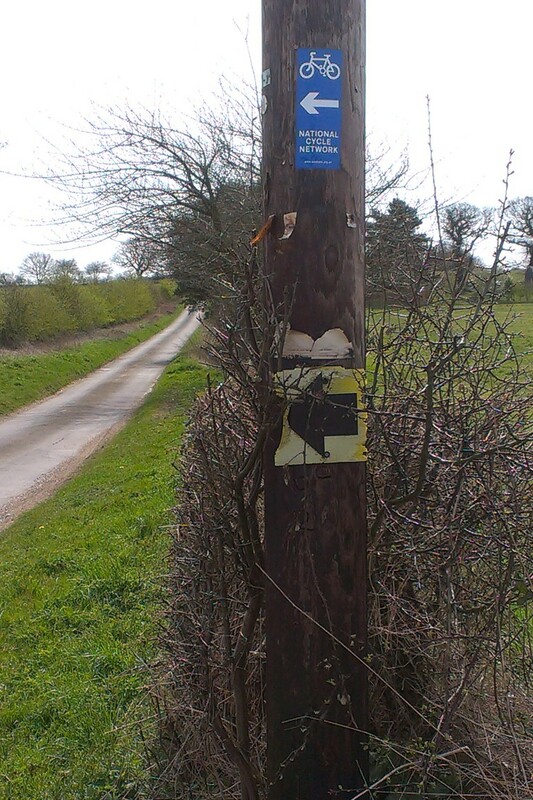 I was also reminded that the two signs on a telegraph pole on Frog Hill Road north of Croxton will need replacing soon, as they’re looking a bit the worse for wear. I went out today for a routing route inspection as part of a longer bike ride. All the signs were fine, so now work was needed. 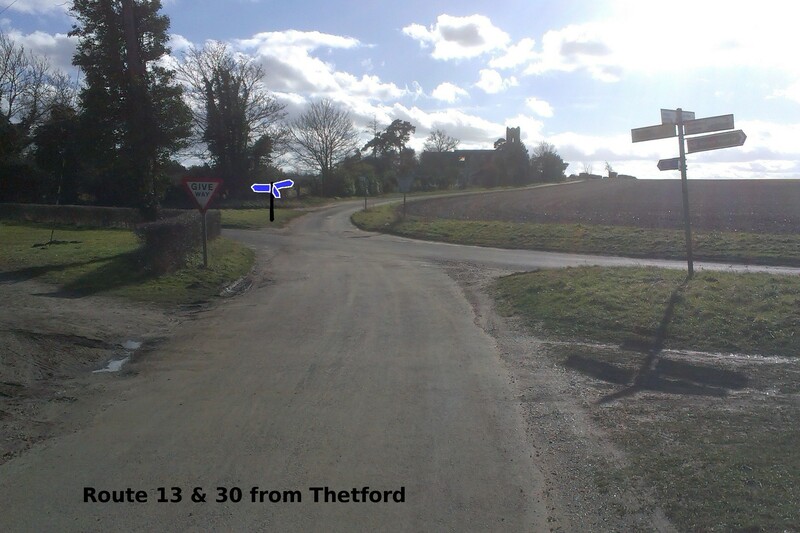 I did however have a closer look at a known problem — that of how to sign the junction at Knettishall where route 13 and 30 meet. 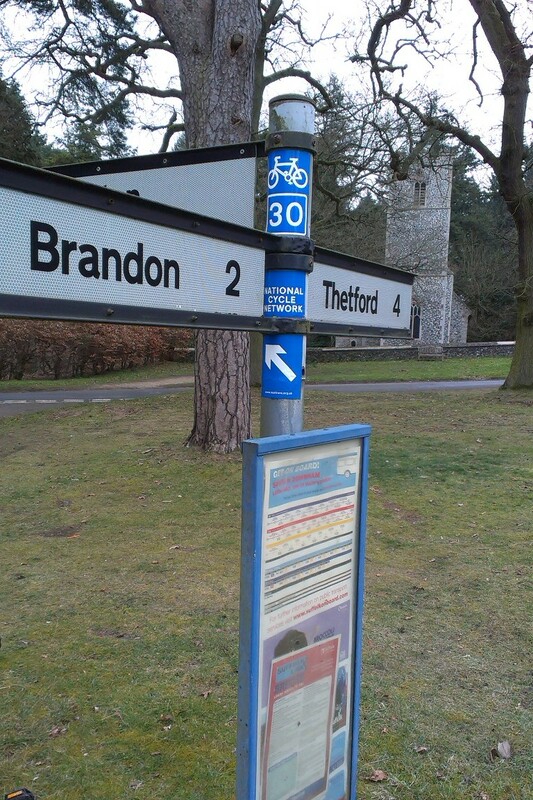 It’s difficult to do using the standard ranger signs, as from each approach there are two directions to take, with different route numbers applying. 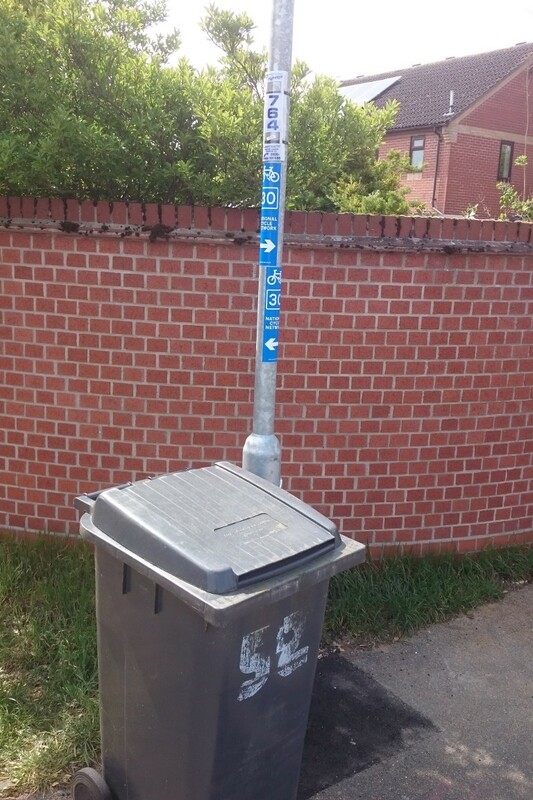 From one approach there isn’t even a suitable sign post to attach any signs to. I think the long-term solution will have to involve permanent signs. 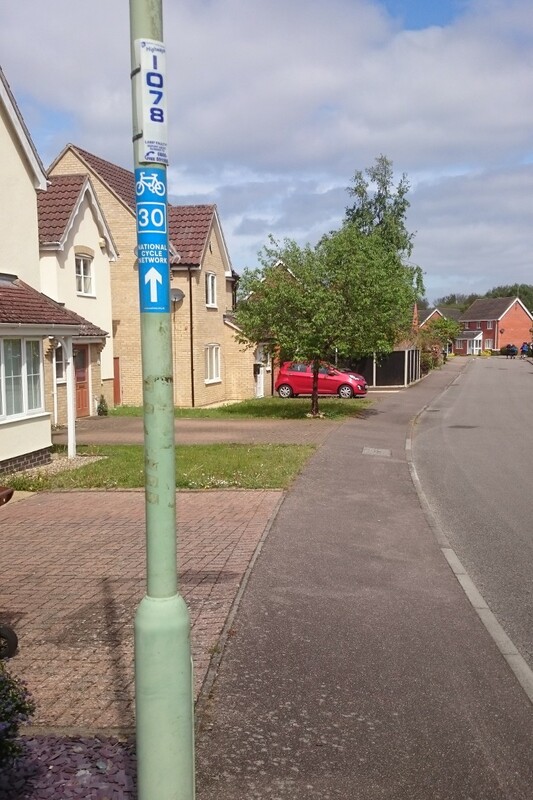 Probably some combination of adding facing panels to existing posts on the approaches, and maybe installing a new post at the junction. Photos showing the three approaches, and a possible position for a new three-way sign are shown below. 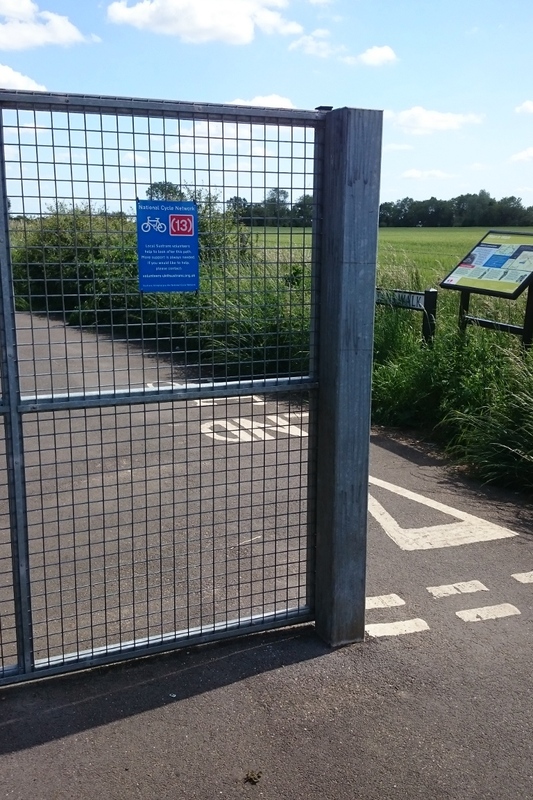 Maybe Suffolk County Council can be persuaded to do something here, as part of the Suffolk Year of Cycling. 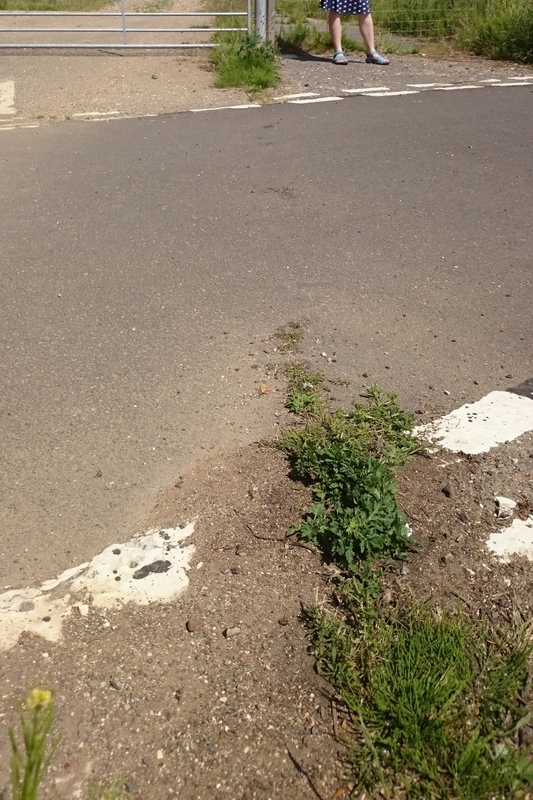 Out of the blue, I’ve been contacted by Suffolk County Council about this junction, and hopefully they will be able to do something to improve the signing. See Knettishall Cross-Roads Signing.